P0993. ARTUR SCHNABEL: Sonatas Nos. 3 in C. 17 in d & 22 in F (all Beethoven). (Canada) St Laurent Studio YSL 78-061, recorded 1933-34. Transfers by Yves St Laurent. "Schnabel was known for championing the then-neglected sonatas of Schubert and, even more so, Beethoven, including his more challenging late works. 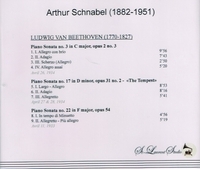 Schnabel did much to popularize Beethoven's piano music, making the first complete recording of the sonatas, completing the set for the British label HMV in 1935. This set of recordings has never been out of print, and is considered by many to be the touchstone of Beethoven sonata interpretations, though shortcomings in finger technique mar many performances of fast movements. (Sergei Rachmaninoff is supposed to have referred to him as 'the great adagio pianist'. It has been said that he suffered greatly from nerves when recording; in a more private setting, his technique was impeccable. Claudio Arrau has said that Schnabel's live performances during the 1920s were technically flawless. He also recorded all the Beethoven piano concerti."